Take some time to read the verses before this one. There were 10 lepers who asked Jesus to heal them. All were told to go to the priest and confirm their healing. All were healed but only one, a foreigner, returned to Jesus to thank Him. We experience this ourselves often. We do things for others but they don’t think about thanking us. Being thanked is not or should not be the reason we do things for others. Jesus didn’t heal them for them to thank Him but He did comment on the lack of thanks from nine of the ten. Why is it we should give thanks? It is to confirm we have received what another has done. The one who came back to Jesus to thank Him was confirming he received what Jesus had given. We are not told whether the other nine kept their healing but we are told the one who returned kept his. When we are given something we claim ownership through our thanks. Our question is do we give thanks to God throughout the day for all He does for us? God gives the next breath we take to us. We are told to give thanks in all things. We can choose to live a life with thankfulness or a life with complaints. A lack of thanks is a sign of indifference. Let us not be indifferent to God. We were coming out of a Fast Food restaurant and I noticed a beautiful sunset. There was a man standing outside smoking a cigarette. I pointed out the sunset to him saying, “Isn’t that beautiful.” As he looked I hurried on into the car. As we pulled out of the parking place I realized I missed an opportunity. I should have slowed down and continued my comments giving glory to God for creating such beauty. I will never know what door that comment would have opened with that man. So, as I asked God’s forgiveness for being in such a rush that I missed an opportunity for Him, I also prayed for that stranger. I prayed that the next person God sends in that man’s direction will not be in such a rush as to miss an opportunity to speak of God. I also asked God to help me be more mindful of His schedule rather than concentrating so much at the tasks I’ve placed in my schedule. I know this isn’t the first opportunity I’ve missed. Knowing how easy it is to be distracted it probably isn’t the last opportunity I’ll miss. While it stays fresh in my mind I’ll be more aware but, as has happened before, with time it will fade and my distractions will interfere. You probably share the same problem. Our question is are we willing to slow our pace a little and listen to God’s Holy Spirit within us as we go through our days? Like learning to put the brakes on a bicycle when we first learn to ride, we must learn to walk more attuned to God while we walk through our various tasks. John really knew his place. He regarded Jesus as his chief. A chief is a boss who is in charge. Most of us have trouble with someone being in charge of our decisions. We like to think we are capable and self-knowledgable to make most of our decisions on our own. Because os this misguided thinking we tend to set off on our own without consulting our Chief. This can take us off course until we realize God wants us in a different direction. It’s hare because it’s so simple. All we need to do is pause and seek God’s direction for us. Why do we forget? We allow ourselves to be distracted with ourselves. Let us realize He Who has priority over us, Who has been from before the beginning of time,Who is our Christ – our Savior and Chief only wants the best for us. Why do we settle for the good when we can take our direction from Him and have the best. We took a day off and went to a National Wildlife Preserve and a State Park to hike some trails. The scenery was beautiful and I enjoyed taking a lot of pictures. I found myself more interested in taking photos of insects. I was especially drawn to a beautiful blue dragonfly. Most of the time we don’t notice the little things. Often we don’t pray about what we consider to be a little thing. God does notice the little things. Jesus said He even knows exactly how many individual hairs are on our heads. If you can count your individual hairs you might not consider it to be insignificant but most of us don’t think about exactly how many we have. In taking photos of the dragonfly and a wasp on a dead log I got to thinking about how much I miss in not paying attention to the little things. We need to talk with God more often about more things – even what we consider to be insignificant. That is part of fellowship and fellowship is why God created us. Next time we are talking to God and thinking about ignoring something, let’s talk to Him about it. It might be a simple thank You, God for creating such a beautiful blue dragonfly. I did thank Him that one of the food sources of dragonflies is a mosquito. I also thank God for creating mosquitoes for food for beautiful, little dragonflies. I have a couple blind friends. When we are in a crowd and I walk up and say, “Hi” then greet me by name. They know the sound of my voice. I have other friends who call me on the phone and don’t identify who they are. The expect me to know their voice. Sometimes I am distracted when I answer the phone and I don’t recognize my friend’s voice. God speaks to us in many ways. The Bible describes some of the different ways God’s speaks to us. Learning to hear the way God’s voice sounds within you takes a lot of practice. You start hearing by reading and studying the written Word of God, the Bible. As you grow in that knowledge and faith you learn to hear through circumstances, through input from others, and finally through that still, small voice of His Spirit within you. At first you need times of quiet and meditation to hear that voice, but, as you practice and mature in your faith you learn to always be listening for that voice, regardless of what is occurring around you. It is important, once you learn to hear His voice, that you follow through in what He says or you will find your hearing will become dim. Our question is do we really want to hear His voice? Sometimes we don’t want to stop what we are doing to listen. Sometimes we are just too distracted. Practice listening and your joy will be even more abundant. Many years ago someone gave me a ride to a meeting. After picking me up they went and picked up someone I didn’t know. On the way back after the meeting it was obvious this lady did not know Jesus. She also shared how her husband had glaucoma and could only see very large print. We had just purchased left-over large print New Testaments from a church that used them for a revival. I took one of these, signed “from Jesus with love” in the front cover and left it on their doorstep. I thought nothing more about it and did not see that lady again. Several years later I heard a testimony on our local Christian radio. It was a man who shared how someone had left a large print New Testament on their doorstep and by reading it they both accepted Jesus as their Lord and Savior and had opened a Christian bookstore. A few weeks later the lady came to my house and said she thought it might be me who left that New Testament at their door. She wanted me to know what happened to it. They gave it to another couple who accepted Jesus and passed it on to 4 other couples who each accepted Jesus. After that they lost track of it. This goes to prove God’s Word does not come back void. He will achieve His purpose with or without us. But, when we allow ourselves to be part of His work we receive a blessing. Our question is will we be part of His work through passing on His Word, either written or oral? The choice is ours. We have become so accustomed to a fast pace that we become restless and impatient with quiet. Noise and bustle are all around us. Plans get interrupted and we get into a reaction mode. We don’t give God the opportunity to go ahead of us so we make our lives more difficult. We tend to forget we can take God at His Word. He says He will go before us yet we are determined to push ahead of Him. We’re in a hurry and won’t stop to pray and listen. When we find doors closed we must be careful not to push them open. My husband and I learned this the hard way. We had a house in one state for sale and were impatient to buy a house in another state we really liked. It was a new job but we wanted the house and did not want to wait to see how the job would work out. We pushed doors open and managed to do some tricky financing with the bank and bought the house. The job didn’t work out. We moved back to the house that didn’t sell and it took 4 years for the new house we were so impatient to buy to sell. We banged on the door and pushed it open instead of waiting for God to show us which door He had prepared for us to enter. Our question is are we willing to wait, pray and listen and allow God to go before us and prepare the way for us? Matthew 6:21-22 But accumulate for yourselves treasures in heaven, where moth and rust do not destroy, and thieves do not break in and steal. 21 For where your treasure is, there your heart will be also. Store up treasures in heaven. What kind of treasures and how do we store them in heaven? Treasures for heaven are produced through the power of God’s Holy Spirit. The treasures are the fruits of His Spirit: love joy peace, patience, kindness, gentleness, self control, faithfulness and goodness. Anything that produces any of these fruits is a treasure being stored in heaven. All our thoughts, words and actions should be measured against these fruits. We criticize, judge and condemn so often without really thinking. We seek for self-gratification rather than helping others. We seek material wealth and possessions rather than giving of our best to others in need. Our question is what do we want as a treasure and where do we want it? We were at a State Park and I had the joy of taking this photo. The dragonfly on the lily flower reminded me of the above verse. God provides for all of His creation. The dragonfly has no problem with relying on God to provide. We humans think we must worry and stress about our provisions. We all have some work to do to receive God’s provision. 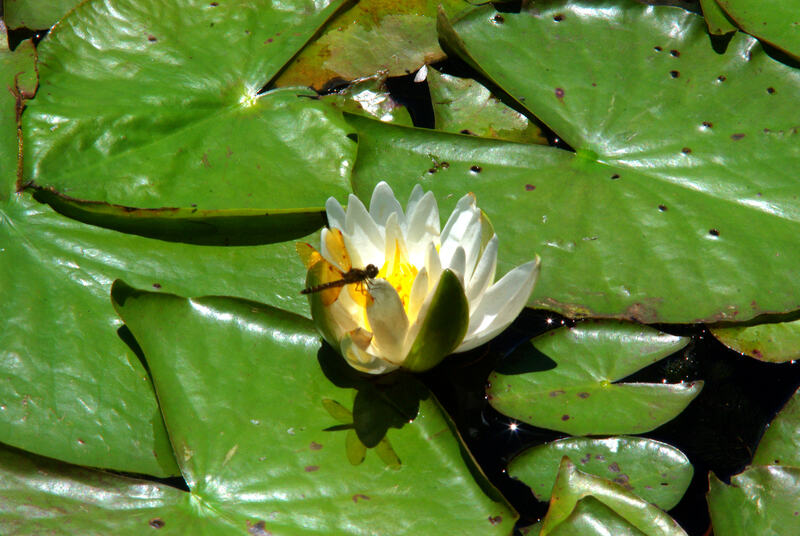 The dragonfly had to flap its wings and fly to the lily. God give us physical bodies and minds that enable us to work. Work is not a “four letter word” of negativity. It is a privilege and joy to be able to work. When we have the problem with work it is because we are not working unto to Lord. He has said in all we do we are to do it unto Him. It matters not if we are collecting garbage, washing dishes or running a country. All we do is in fellowship and to the glory of God. Our question is are we complainers or are we thankful for the abilities God gives us and the provisions He gives us through these abilities? Jesus told us we are the light of the World. He also said we are the salt of the earth. Light is to show the way. Salt is to preserve from rottenness and death. It is also used to produce or accentuate the flavor. We, as Christians, are to be preserved from rottenness through the indwelling of God’s Holy Spirit and the confession and forgiveness of sins. We are to produce or accentuate the flavor of God enticing others to want to taste and see that He is good. (Psalms 34:8 Taste and see that the LORD is good; blessed is the man who takes refuge in him.) Our question today is are we salty? Are we allowing enough of God’s Holy Spirit in and through us to not only taste of Him ourselves but to entice others to taste and see?